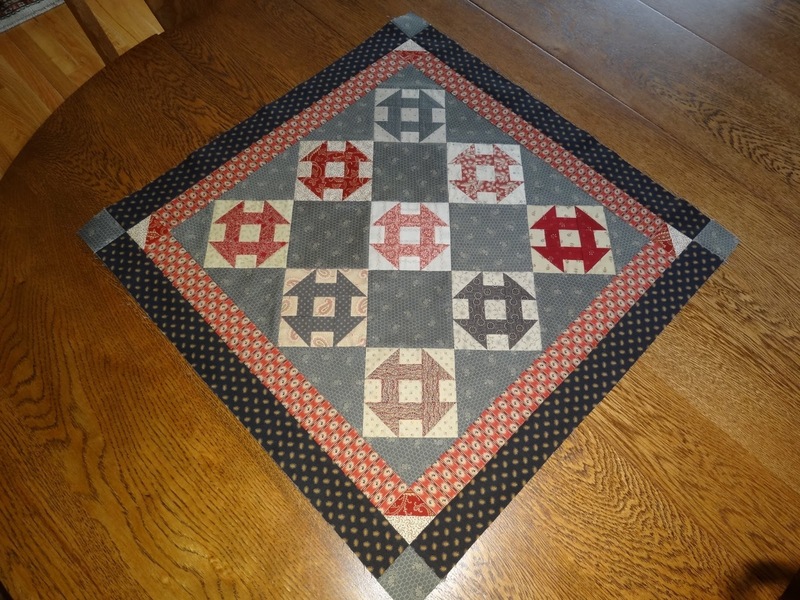 Squash House Quilts: Quick Piecing Fix! I had to interrupt my plan of blogging some cool shopping while we were in Napa - that will be next. While we were gone I began to go through piecing withdrawal! Two weeks is a long time to be away from my Bernina sidekick. When we left I had a small quilt ready to go on my work table and as soon as we returned I needed a fix! What better to do than piece it together! Here is the quilt top all finished! It's from Jo Morton's Banner Day book and is called Simply Sweet Churn Dash. I made it with some of the fabrics Jo used in hers along with some that she didn't. The quilt top measures 23 1/2" square and contains my very favorite block - the Churn Dash. Mr. Squash thought the blocks looked like Celtic rings when I first showed it to him. I had to turn it on point so he could see the Churn Dash. This was a fun, quick and easy project and I am no longer going through piecing withdrawal! Most of you know I have another obsession - gadgets! Here is my newest. It's a spoon holder that I found at the Culinary Institute of America's kitchen shop! I had my doubts about whether or not it would work, but it does! The spoon is hovering over the beginnings of my homemade chili. It's a rainy, soggy day and what could be better than chili and homemade skillet cornbread! All of a sudden I'm getting some sort of Photobucket thingy overlaying the beginning of my blog. I don't even have a Photobucket account. I didn't put it there and can't seem to get rid of it. ***Edit - I found out the problem is with my blog designers who won't return my emails. So stay tuned for BIG changes as I'll have a whole new blog design real soon! That is a very sweet little churn dash quilt. Is Mr. Squash Irish? :o) I tried a spoon thingy just like that and flipped my spoon onto the floor, repeatedly. Abby was happy. Bummer about your blog Gremlin. I had a Gremlin yesterday too--some toolbar loaded itself on and I had to reset my Firefox to get rid of it. Grr. Hope you find a solution--sorry I can't offer one! Oh how I love a good churn dash, this is my fav block and I love the fabrics you chose. Great pics of your journey home. I'm of no help on the blog issue, what a PITA. The photo bucket thing is showing up on your entire blog when I look at it - not just the beginning. Weird! Love your quilt...gorgeous! Sorry to hear about your blog problem...have never known of this to happen. Can you click on it and then remove it? yeah, that photo bucket thing is weird. I know nothing about them. Love your quilt. 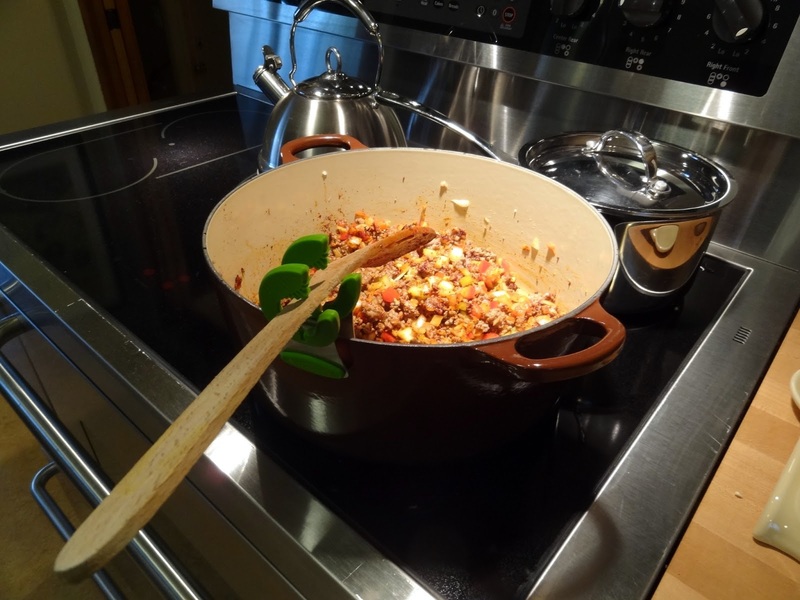 I made italian sausage soup today. Dreary here today too. Yeah, that photobucket thingy is really annoying. Love your churn dash little quilt. It's my favorite block too. I'm gonna have to pick up that book! Churn dash is my fave bock as well! Love your little JO quilt. 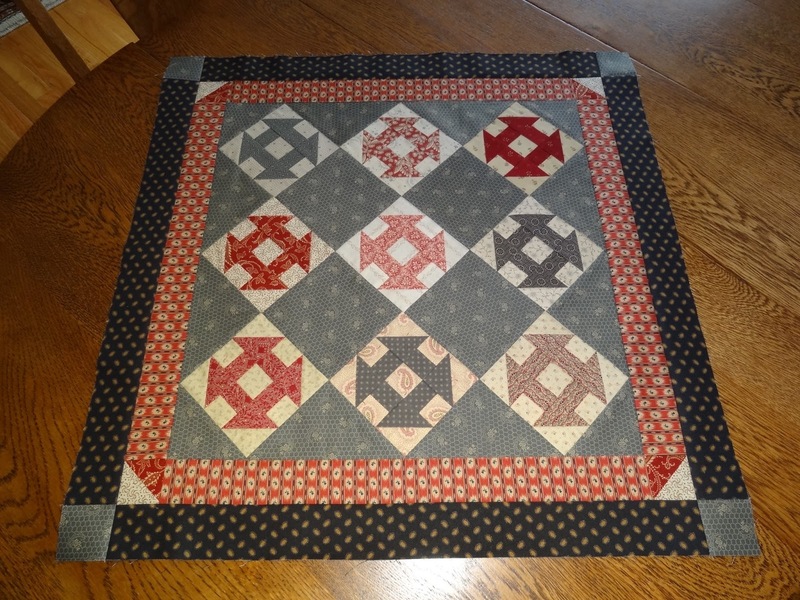 Mini quilts are great for overcoming piecing withdrawls...hand quilting withdrawls too! New blog design? I can't wait! I've been thinking about changing mine up as well. I'm just deciding who to go with. This is a great little quilt! Glad you were able to get your fix! Very simple and sweet looking quilt! Charming colors! Love the new Churn Dash. I'm like you when I've been away I need a fix badly. I also love the new gadget, I also have a thing for gadgets, especially kitchen gadgets. Good luck with your new blog design!! Hugs. Who doesn't love a churn dash?! It's cute and love the size!! !